As residents of San Dimas, we believe a large commercial hotel is not the best use of the vacant lot at Bonita and Cataract. We believe the City Council should rethink the current plan and consider other proposals. We hope any future development at this location would positively impact those who live in the immediate area, benefit all city residents, and enrich our historic downtown. (3) make a resolution that the Council will not approve a large commercial hotel to be built at Bonita and Cataract. San Dimas City Council Meeting TONIGHT, Tues, 1/22/19 @ 7pm @ City Hall. The Council has a closed session with hotel developers re: "possible sale of property" @ Bonita & Cataract. 1) ATTEND the meeting and tell the Council know that you oppose the hotel project. 2) If you are unable to attend, EMAIL all the City Councilmembers (email addresses @ NoBigHotel.com) about your opposition to the hotel. 3) SHARE this petition with others who will sign in opposition to the hotel. 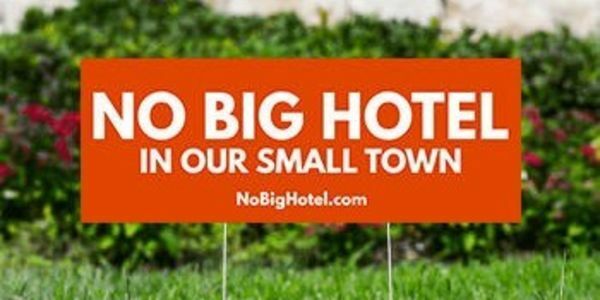 110+ households requested signs in opposition to the big hotel in San Dimas, and 200+ people signed the petition. We invite you to attend the 1st City Council meeting of the year on Tues, Jan 8, at 7pm at City Hall. Having a large contingent attend and speak up is the most important thing we can do to stop this hotel project from moving forward. We plan to submit this petition to the Council at that time. Please email if you plan to attend: sandimaslocals@gmail.com. Thanks and happy 2019!